enjoying their work... recording is excellent..." Gramophone. 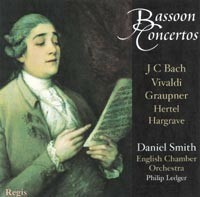 "Daniel Smith ia a most able soloist, velvet-toned and fluent, and the ECO are in fine form, crisp, spring-headed and apparently enjoying their work. The recording is excellent, with the soloist comfortably to the fore...I thoroughly enjoyed this recording and recommend others to do so."